Learn to breed dragons and save the kingdom! Venture into the world of dragons and magic creatures in this Time Management double pack! The kingdom is cursed! An evil witch turned your beloved Princess into stone and you have been banished from the kingdom! 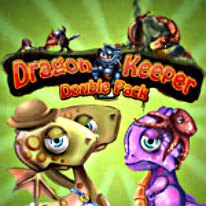 Travel deep into the mountains and find help from the magical dragons to break the spell in Dragon Keeper! The evil witch is back! The Prince has been turned into a goldfish, and the Princess has to save her beloved husband. Breed dragons, hire a variety of magical creatures and learn how to cast dragon spells in Dragon Keeper 2! -Defend against thieves and earn wonderful rewards!